PALO VERDE NATIONAL PARK, Costa Rica –– Most caterpillars are like stubborn teenagers – their rooms are a mess. But this is not true for the Hesperiidae. Better known as “skippers” for their quick and darting flights as butterflies, Hesperiidae tend to keep their shelters clean as caterpillars. Like really clean. It’s a skipper family trait. But what has caught the attention of researcher Christina Baer are not the skipper caterpillars’ housekeeping habits but the subtle differences in architectural structure of their shelters. “There’s variation in architectural styles of the shelters,” Baer said. Some of the caterpillars build on broad leaves, while others build on blades of grass. Baer, a doctoral student at the University of Missouri-St. Louis, has spent much of her time this summer at a biological station owned by the Organization for Tropical Studies at the Palo Verde National Park in Costa Rica, where researchers and students journey to learn more about the diverse species of plants and animals living there. She suggests that these shelters may protect the caterpillars from the elements, but more likely are a place to hide from predators such as birds, ants or wasps. Parasitoids – other insects that lay eggs inside a caterpillar so that their young will have food when they hatch – are a major threat to the skipper caterpillar. Baer searches for caterpillar samples at Palo Verde National Park. She says her favorite place to look for samples is along the road leading into the OTS station at Palo Verde. Photo by Lisa Button. In the mornings, Baer ventures out of her OTS lab on the hunt for caterpillar samples. 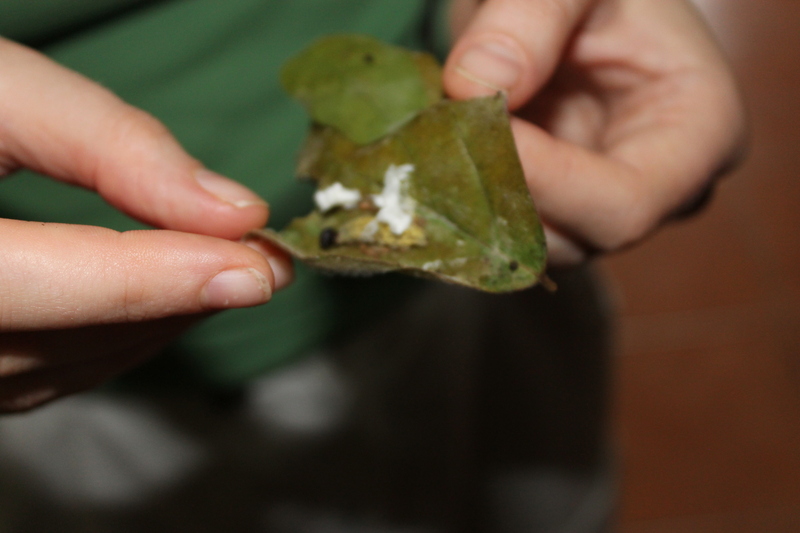 She has become adept at identifying which plants are more likely to house a skipper caterpillar. Dozens of bags, each containing a single skipper caterpillar and its shelter, line a wall in Baer’s lab, allowing her to examine and record their habits. The differences in caterpillar building styles form the core of Baer’s research. 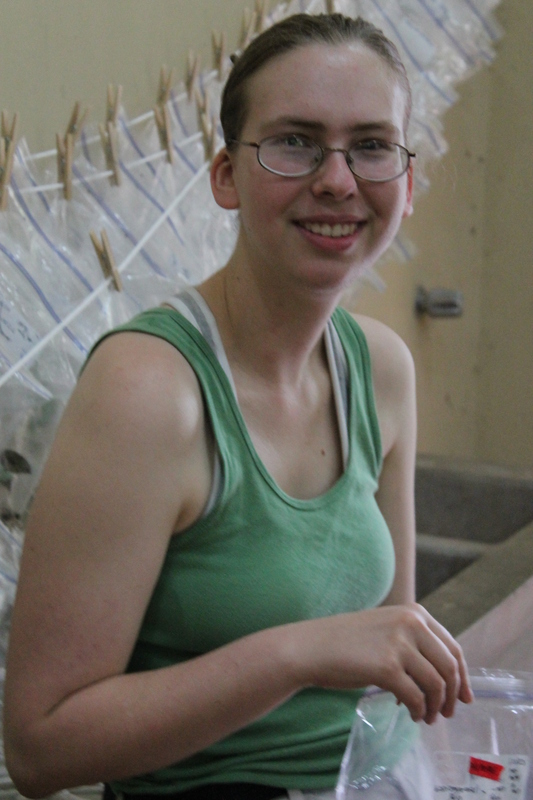 After her 10-week stay with OTS in Palo Verde, Baer will journey home to St. Louis with caterpillar samples. 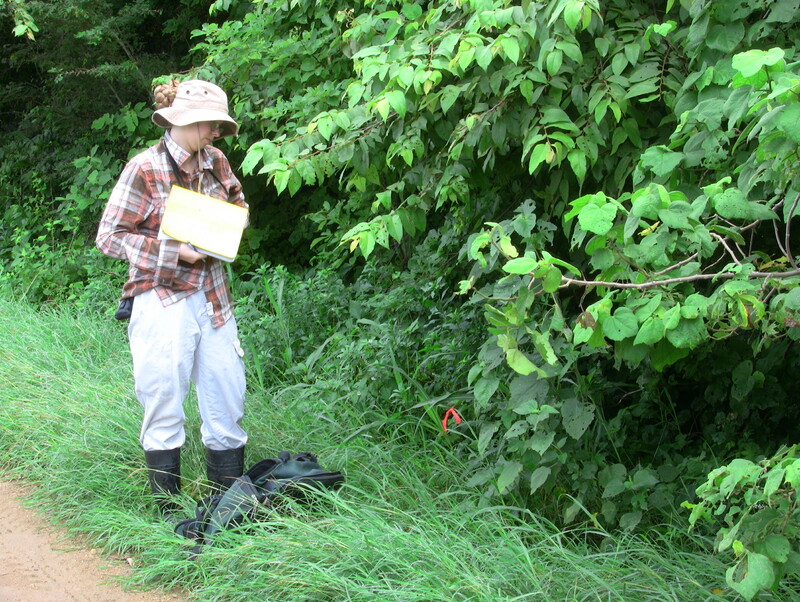 There, she will begin a process of DNA bar-coding to look for variances within the Hesperiidae species. “Skippers are a family of butterflies, with hundreds of known species in Costa Rica alone,” Baer said. Species within the skipper family are believed to be made up of separate groups or lineages. These groups could be considered cryptic species, which means there is “variation and separation in a single described species,” Baer said. Identifying variation and degree of separation within the Hesperiidae species will allow her to better understand their natural habits, such as their differing architectural preferences. While some scientists will argue that subtle variances in a species’ DNA could suggest that there is a species within a species, others question how much variance constitutes a new species. If the skippers’ shelters are a mark of a different species altogether – slight as those differences may be – Baer’s work will serve as an example of how scientists can use DNA samples to help determine whether certain variances are the sign of a new species. My first story here in Costa Rica!